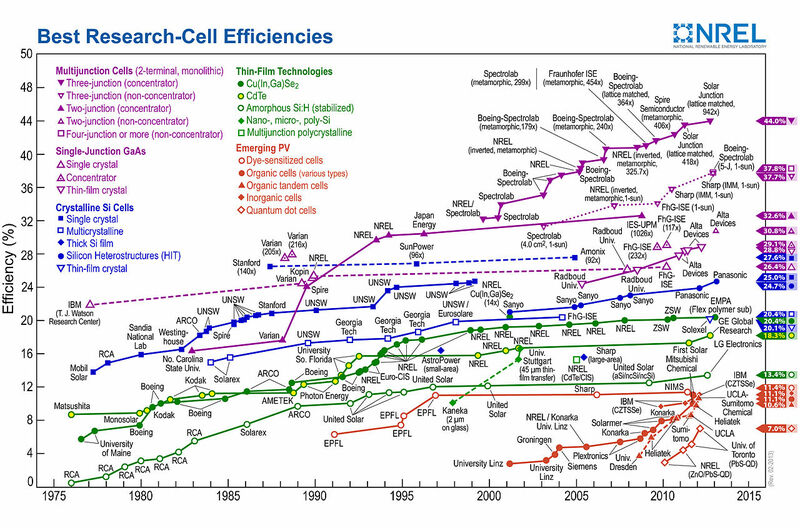 The other key point I noted above was that the solar cell efficiency record was for “non-concentrator” solar cells. Beyond adding junctions, one can increase the efficiency of a solar cell by concentrating light. As you can see in the graph above, the highest-efficiency solar cells are multi-junction solar cells that also benefit from concentration. Incidentally, Sharp also tied the solar cell efficiency record for this higher category last year, reaching 43.5%, a record which Solar Junction had already set, and which it has now risen to 44%.